Elephants are the largest land mammals on Earth. Two species of elephant, the Asian elephant and African elephant, remain extant. Elephants are herbivores and prefer habitats that give them access to food and water. Both species consume as many as 300 pounds of food per day. Despite obvious similarities, there are key physical differences between Asian and African elephants that distinguish them from each other. African elephants are larger than their Asian counterparts, averaging a shoulder height of between 10 and 13 feet and weighing as much as 14,000 pounds or more. Asian elephants average a shoulder height of between 6.5 and 11.5 feet and weigh as much as 13,000 pounds. The quickest way to tell an Asian elephant from an African one is to look at their ears. All elephants use their ears to cool themselves off. While an Asian elephant has small, rounded ears, African elephants have large ears that reach up over their necks. Their hides are also different. Asian elephants have smooth hides that range from dark gray to brown with pink patches. African elephants have wrinkly dark gray hides. Asian elephants have a finger-like extension on the tips of their trunks. African elephants have two finger-like extensions on theirs. Elephants use this extension to grasp food and scoop it into their mouths. Tusks come in handy for clearing paths, debarking trees and establishing dominance. Female Asian elephants do not usually have tusks, and when they do they are so small they are barely visible. Many male Asian elephants lack tusks as well, but those that do have them have large ones. However, female and male African elephants have tusks. Males tend to have longer tusks than females, and they use them to fight other males over females. Asian elephants are grazers, which means they consume whatever is on the ground, typically grass, as well as low vegetation. African elephants, in contrast, are browsers, which means they eat twigs and vegetation on higher levels, such as trees and shrubs. Asian elephants have been domesticated by humans, and are used as beasts of burden or as transportation. They have also been used in wars. 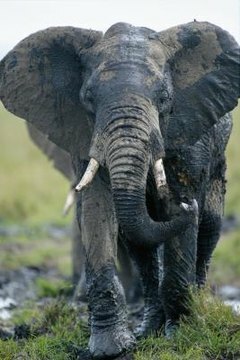 African elephants are not aggressive, but are far more difficult to domesticate. For this reason, it is far more typical to see Asian elephants in circuses than it is to see African ones. What Type of Climate Does an Asian Elephant Live In?